When it comes to food, there are some wonderful places to treat one's palate. Some of the best village tavernas are hidden away and simply waiting to welcome you. The following are a handful, but of course there are more. 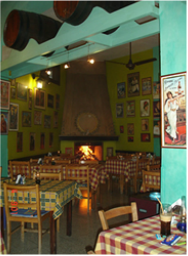 This is a superb long-established family-run taverna, serving delicious vegetarian and meat mezes. Their wine is excellent, as is the hospitality and general ambiance. Home made Greek and East Mediterranean food with daily specials, innovative Imogen's Meze & Vegetarian Meze and home made cakes and refreshments served all day in a friendly atmosphere. As recommended by and featured on National Geographic Restaurant Guide, BBC Travel Show, Lonely Planet, Time Out, Paphos Times, OK Magazine. Established for 14 years and recognised internationally for maintaining its high quality food and standards. Open Daily except Wednesday, bookings recommended. Your hosts: Maria & Apostolos. 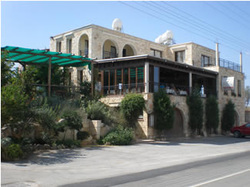 Situated on the outskirts of Kathikas, the Petradaki Taverna is an impressive three storey stone building, owned and run by Bambos and Nikki Polemitis. Bambos and Nikki offer top quality Cypriot and International dishes and excellent wines, all at reasonable prices. Their Cyprus Meze is recommended as well as the excellent wine from their own vineyards. 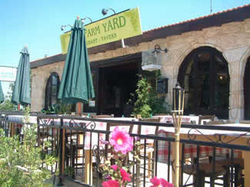 The Farm Yard Tavern is a traditional Cyprus village tavern on the Polis to Kathikas-Stroumbi road. Upon entering the Farm Yard restaurant tavern, you will receive a warm welcome in a relaxing and tranquil setting. Offering fantastic views of the Troodos mountains and surrounded by beautiful settings. Authentic Cypriot food in traditional setting. The restaurant was originally established as part of the Laona Project (formally Araouzos Tavern). 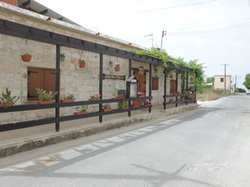 This taverna is a must visit, for it's wonderful, delicious, voluminous meat meze alone, or maybe try the succulent suckling pig with Cypriot potatoes Friendly service, not at all expensive, and the house wines by the litre are very good and value for money.